The limitations of the Orange Vegas should, however, be taken in context of the low-cost price-tag. It provides a taster of fashionable touch control, albeit in a very limited way, and has few pretensions in the additional features department. Its interface is functional, but won't make you feel you're experiencing anything particularly novel or essential. User interface aside, you could get more functionality for your cash in a conventional handset, but for any cash-conscious buyers considering the Orange Vegas, touch control – however limited – will be the deal-maker. As the cheapest, lightest and smallest touchscreen-equipped phone to hit the UK, the Orange Vegas is bound to excite curiosity from mobile buyers tempted by a bargain-priced taste of touchphone action. But while it dabbles in tap control technology, with a 2.4-inch full touchscreen display, at under £50 on pre-pay Orange's own-brand Vegas deals a more modest hand when it comes to other more conventional functionality. The Vegas has an entry-level feature set-up, including a low-grade 1.3-megapixel camera, a music player, and an FM radio. MicroSD card expansion is included too, with cards up to 4GB supported, though none is boxed. Its browser is set up for the Orange World mobile internet portal, with free access to Facebook, MySpace, Twitter and Bebo included on Orange Dolphin pay as you go deals. There is, however, no high-speed 3G connectivity for zippy browsing, or for high-speed multimedia connectivity (only GPRS is available on this dual-band handset). Alongside the trend-savvy touchscreen appeal, the Orange Vegas attracts attention with its compact bodywork. Available in either matt black or pink, with chrome trim, the phone has dinky dimensions for a touch phone (93(h) x 53(w) x 16(d)mm) and weighs a pocket-or handbag-friendly 84g. 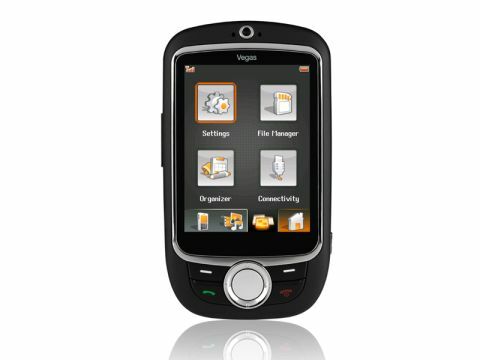 The 2.4-inch QVGA display is smaller than most touch devices, so screen finger space is limited. However, a small extendable stylus is tucked into the back casing of the Vegas, allowing more precise screen jabbing when required.